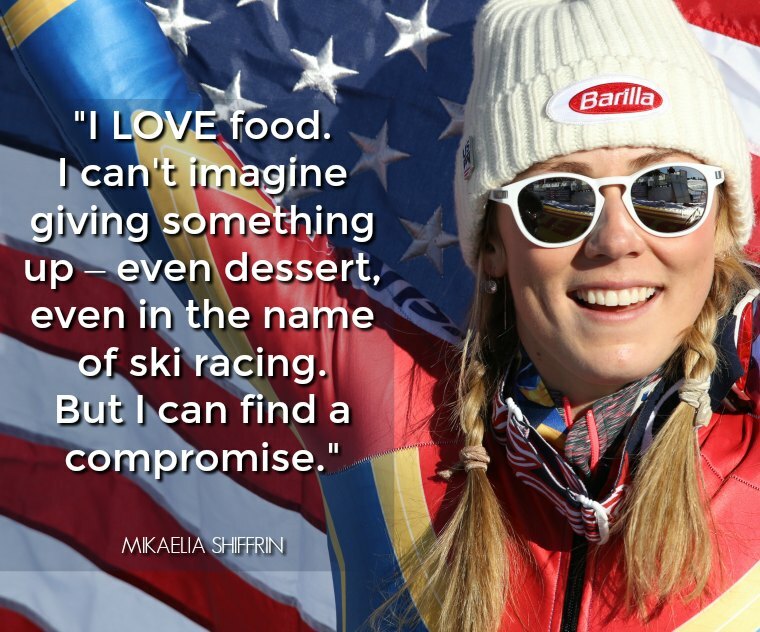 We love getting the real scoop on how elite athletes train and eat, so we were psyched when our pals at Barilla hooked us up with the opportunity to send a few questions over to alpine ski racer Mikaela Shiffrin, 2017 World Champion and big time food lover. The 22-year-old had a heck of a season, winning her first season title, earning the Overall Crystal Globe (oh, and by the way, she’s the fifth American and third woman ever to do this) — and this is all in addition to winning her third straight Slalom Gold Medal and earning a bright and shiny Silver in Giant Slalom at the 2017 World Championships. Shiffrin is gearing up for the 2017-18 season which, as you may have already deduced, will include the Olympics. So how’s she preparing for what’s sure to be a big year? You know we asked her all about it! What’s your fave workout to do off the slopes? Any moves you really love — or love to hate? Mikaela Shiffrin: I sort of love to hate all of the moves that I ever have to do! I think my favorite workouts are generally the core workouts. The burn you get in your core is that immediate gratification — you can feel it and you know you’re getting stronger. I feel like my core is strong, my back is strong, and it just ties everything together. What are your fave foods or recipes? Is anything off-limits? MS: Nothing is really off-limits. I try to limit the sugar but I like to eat dessert so I don’t cut it out completely. My favorite go-to meal, especially when I’m racing, is a simple pasta dish with maybe some chicken and salad or some vegetables — broccoli or something like that. It’s super easy, and it’s flavored with butter and garlic and salt. It’s one of the only things I can eat before races when I’m really nervous, but it’s also one of my favorite meals outside of competition season. Can you tell us about how your nutrition or training will change going into racing season? MS: I try to keep my nutrition consistent — I don’t follow any diet programs. Going into the race season or the Olympics … there’s a theory of carb loading, which I sort of do. Before races, I might go a little heavier on the carbs and then after go a little lighter — just to get a little extra energy for the long race days. But there’s not a very big change in my nutrition program. Or even in my training — it’s just always about trying to make the most of any second I get on the snow, on my skis. What are your top tips for someone who wants to improve their healthy lifestyle? I think a lot of people say, “I want to get healthy, I’m gonna detox,” and — I don’t even know what detox means. I think it’s something like starving yourself for three days and only drinking smoothies, or tea, or something? I don’t know how you can do that. I feel you should take it step by step. Like, I go through phases. I want dessert every night. I make cookies every night and I have dessert. And then I get to a point where I’m like, okay, it’s time for me to stop having cookies every night. You just take little steps. And then I’ll say, I’m going to stop having sugar three days a week. And then, all of a sudden, you’ve gone a week without sugar and it’s really easy to continue, and you don’t crave it. How do people get it wrong when it comes to carbs? MS: Some people say they want to cut out carbs, and, for an athlete like me, carbs are necessary. For the average person, [too many] carbs can be a really big bummer, but carbs are necessary for energy so you want to make sure you’re balancing that. You should find a couple of go-to recipes that are delicious and give you what you need. Like I said, go step by step — you don’t need to eat a whole bowl of pasta, but maybe you have an accompanying side dish along with your meat and your salad. It’s like finding loopholes to satisfy what you want and not cut it out all together. I LOVE food. I can’t imagine giving something up — even dessert, even in the name of ski racing. But I can find a compromise. What are you most looking forward to with the upcoming season and getting back into competition mode? MS: I’m just looking forward to getting back to racing. Our first race is at the end of October and it’s always a really exciting time. Everyone’s coming back together again, you see competitors you haven’t seen all summer. That first race of the season is always nerve racking because you don’t know where you stack up against everyone, but it’s really fun too. When I’m actually doing it, I’m really nervous and just wish it was summer again. But right now I’m looking forward to that!